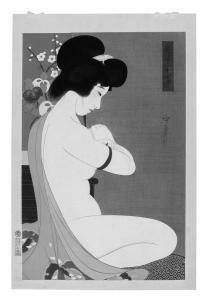 Find artworks, auction results, sale prices and pictures of Morikane at auctions worldwide. Morikane - (24 Charmante Figuren). Eine Nackte Junge Frau Hockt Auf Dem Boden Neben Einem Schubkasten. Bez. : Morikane. Siegel: Morikane. Verlag: Shinbisha. 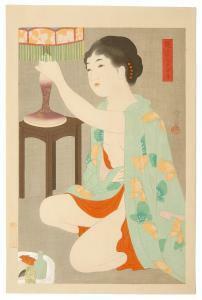 Depicting a young woman in a blue kimono beside a paper lantern. From the series Twenty-Four Figures of Charming Women.